6-ply doubler for any diaper or an insert to layer into a pocket diaper to replace microfiber inserts. Made from Cloth-eez Prefold fabric. Sold individually, or save when buying in packages of 12. Measure the size of what you want to replace and see if this works for you. A 6-ply doubler-insert to layer into a pocket diaper to replace microfiber inserts. These are 6-ply. That means six layers of cotton prefold fabric, which is 2 layers less than our other doublers, however they are wider. One is NOT enough in a pocket diaper, except for a very young baby. Layer 2 or even 3 of these in the pocket to get the absorbency you want. We chose to make these 6-ply because they dry very fast, wash cleanly very easily, and allow for customized absorbency needs. Want it trim? Use 2. That is 12 layers. Need more absorbency? Use 3 of them in there. Choose your bulk-level; choose your correct absorbency for your needs. The big benefit of these is how easily they come clean in the wash. Say goodbye to stinky microfiber. Use them for dusting instead. The skin on your hands will be happier too when you stop touching the microfiber inserts. Cotton feels so much nicer. Should you decide to move away from synthetic pocket diapering and switch over to 100% cotton diapering, you don't need to purchase any doublers because you already have these on hand. The same lovely prefold fabric as our beloved Cloth-eez® prefolds. These are wider than our regular Cloth-eez doubler for a better fit when stuffing synthetic pocket diapers. They are quilty just like prefolds are so they come out of the dryer curly and need to be flattened out by hand a bit. This is the nature of the twill prefold fabric. These are also suitable as doublers for extra absorbency in any style diaper. Measurements are approximate. Shrinkage varies. Chlorine-free white 100% cotton. Made in Pakistan. The red edge size shown is now made with BLUE edges. If you have these from prior years, please note that we have changed the edge colors. The former small which had light blue edges is now made with light green edges instead. The old red is now the blue size which is large. We changed the edge colors to match the Novice and Intermediate prefold edge colors. They are also now just a little bit wider to better fill the pocket but basically they are the same as before but with new edge colors. 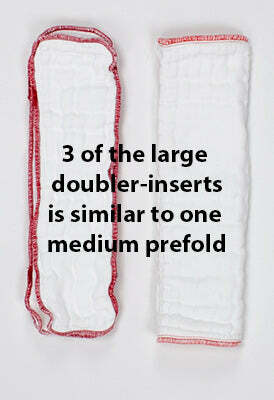 Stacking 3 large doubler-inserts is similar to using one medium red edge prefold diaper. So if a medium prefold is too much bulk for your pocket diaper, try using just 2 of these doubler-inserts for a trimmer fit. Stack them together, grab both ends together and place it into the pocket all at once, as if it were one item, at the same time. Stuffing two is not very different than stuffing one because it is still one stuffing motion. 12 layers would be too thick to wash and dry so using two 6 layer inserts together in the pocket really does makes sense. Need more for nap or night? Use 3 at the same time. What is the difference between a doubler and and insert? The width and the layering are a little different but they very similar. You can use these as doublers. Inserts are a little bit wider than doublers and the width is needed to fill up the space in the pocket. These are 6 ply. There are many choices for absorbency but something that is 100% cotton will always wash up more easily than any other absorbency fabric. Size Small after shrinkage measure about 11.5 inches long by 4.7 inches wide. Size Large after shrinkage measure about 15 inches long by 4.7 inches wide. Prefold fabric is quilty, curly and variable. Sizes are approximate. Shrinkage will vary. These cotton inserts were exactly what i expected! I used 2 to lay in a cover when I ran out of clean diapers and I’m sure they will be awesome to add extra absorbency or for replacing microfiber inserts. I bought the small and fit perfectly in a cover snapped on the smaller rise but I’m sure they’ll still fit on a medium rise. I would recommend. These inserts are very nice, and well made. They wash and dry easy. We use them in pocket diapers on top ( I don’t like to stuff pockets). My kid only need two per diaper change during the day. Very pleased! I bought these just to try. Just went ahead and bought the dozen. And absolutely love them. I use 2 for a good trim fit the extra length I fold over in the front and kinda det them in an X shape to make them wider and have more cover in case of big poops. I pair these with the Green Mountain prefolds, Thirsties large hemp inserts. They fit well in my Flip covers, Nicki's Diapers covers, Imagine covers, Grovia covers, and Bumgenius pockets as well. They wash very well and the cotton holds no smell either unlike the microfiber diaper we have. Overall would recommend to anyone with a child. Happy! I use 2 for a trim fit. Bought these size small to use for overnight in thirsties AIO...now I use them for daytime stuffing in pockets (I hate the cheap microfiber soakers) I use two as I love a trim fit on my 15 lb, 5 month babe. I can’t say how happy I am! Pros: soaks up lots of liquid, dries really fast (I wash them before bed and leave them hanging in my laundry room overnight for use in the morning!) no staining as yet. Cheaper than my other fav brand. No cons as of yet. Highly recommend. These are great! I use the smalls as a doubler for my all-in-one diapers and I replace all my microfiber inserts with them in pockets!! I love them.